Are you looking for a unique way to wish someone a happy Christmas holiday who live a distance away or maybe you are looking to send a seasonal card to a pet lover? Whatever your reason for sending electronic holiday cards for business, you can send something special with our seasonal pets design or another from our broad selection of template cards. Just because they are templates doesn't mean to say that they are generic and lack appeal. Our ecards are professionally designed and easily customisable with additional fonts, animations, music and more. Imagine the joy of the recipient at receiving an unexpected ecard? One which is personalised will have even more of an impact. 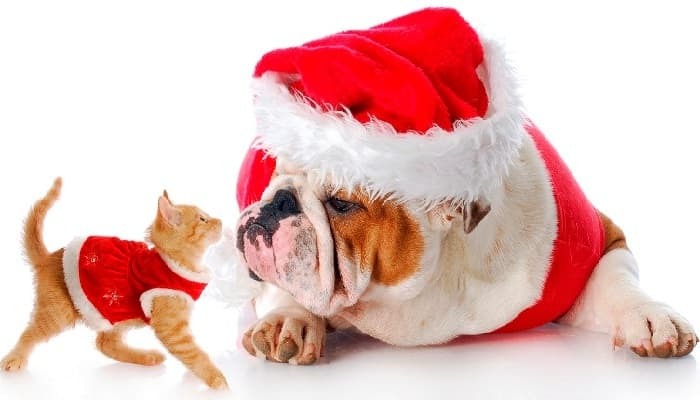 If you are a business owner who runs a pet store why not send our holiday pet’s holiday ecards for business to your customers, suppliers or staff? They are an ideal way to send Christmas wishes cheaply and quickly. In addition you can also add in a personalised message too, great for a company slogan or promotional message. All you need is an email address to get started. Our ecards are of great value too. Reasonably priced yet high quality products which will make the recipient smile. Purchase your template and start customising.